Produce new tabletop adventure and solo campaign supplement for ShadowSea, with new metal and resin miniatures for heroes and enemies. 120 backers pledged $16,590 to help bring this project to life. This Kickstarter will help us produce many new products, with the main focus on the dungeon exploration game, The Stygian Depths - Lost Temple of Xibalba. The Stygian Depths is a supplement for our tabletop skirmish game, ShadowSea - Conquest of the Underground World. Funding this project will also help us produce two-player starter sets with new miniatures and rulebooks for ShadowSea and DeepWars, our game of underwater combat that is 100% compatible with ShadowSea. In addition, we are producing a ShadowSea supplement for Grace Flynn and other characters from the stories of P.L. McCall. This campaign, Grace Flynn - Tides of Forever, will have Grace and her crew lost in the world of the Shadow Sea and have to survive a Solo or Co-op adventure. Lastly, we are producing new miniatures for The Stygian Depths and the Grace Flynn supplements and the two-player starter sets. This is the current list of unlocked and locked stretch goals for this project. 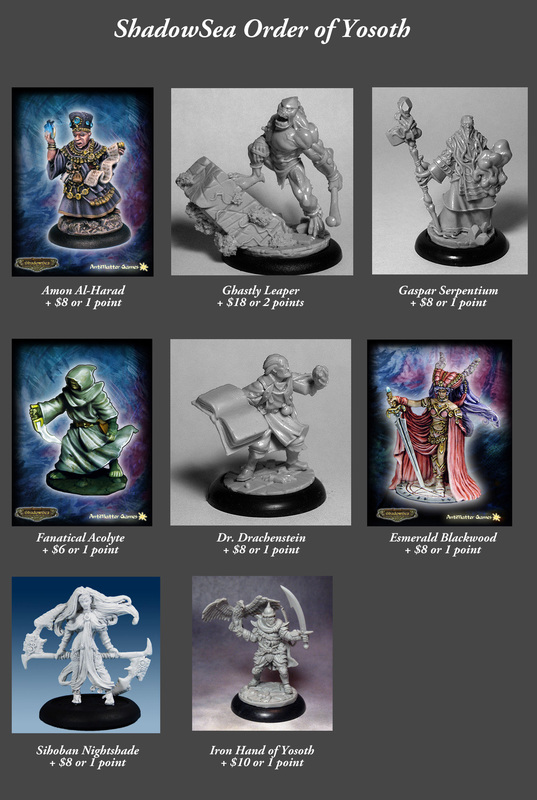 We have already funded the Stygian Depths dungeon exploration game and now we are funding new miniatures to be used in the game. This supplement to ShadowSea will come complete with its own rules section, introducing new special rules for dungeon exploring, so that players do not need to have the full ShadowSea rulebook. The game takes place in the sunken city of Xibalba, located within the shallow waters of Blood Reef. Warbands from any of the main forces of ShadowSea or DeepWars may enter the temples, which have their upper sections exposed from the sea surface, and search for ancient treasures. The game will include printed and PDF versions of the rulebook, floor tiles and cards. he game is designed for solo and co-op play, using a deck of cards to build the dungeon layout with 6"x6" double-sided floor tiles with various rooms, corridors and deadly lairs. The ultimate goal is to reach the Quest Chamber for a scenario, an 8"x10" tile with a unique layout for each scenario. Players may also build their own layouts for competitive battles, having each player start in different sections of the map and then trying to recover as much loot as possible while surviving the dangers of the temple. A room card has been drawn - the player rolls to determine which room variant is used. Each of the tiles for rooms, corridors and lairs has two variants in the layout. The cards from the dungeon deck have the descriptions for each variant. Before each game, players build their dungeon deck using random draws from each of the main floor tile types, then draw one of the Quest Chambers, which itself can have multiple battle scenarios. 6 - 8" x 10" Quest Chambers. This is what is completed so far. We can always add more rooms as Stretch Goals also, but the pledges are set up for this number. Card and floor tiles are printed on high quality card stock with full color on both sides. PDF versions of all cards and tiles are included so players can print and paste onto other materials if they wish. Room tile variant showing the Mystical Fountain room when flooded and dry. The temple dungeon is full of environmental hazards, such as flooded chambers that require a model to swim or have the Amphibious ability, infested rooms filled with toxic fungus, crumbling floors and ceilings that can collapse upon the unwary, and vicious traps and ambushes. Models that survive those dangers must also contend with encounters with the denizens of the temple, Snakemen of Xibalba and their demonic servants as well as strange creatures of the underground that have taken residence in the dungeon. These enemies have their own rules of Artificial Intelligence (AI) that tells the player how they move, attack, use items and otherwise interact within the game. Of course, an opposing player can also take command of the dungeon inhabitants and add some additional challenge. Basic troops has simple AI patterns but the final battles with Bosses in the Quest Chamber have their own special AI rules that take advantage of their abilities and the layout of the room, making the battles a challenge for players to complete. The game will come with paper markers for enemies, with metal and resin miniatures being produced as stretch goals in this project. Some of the bosses from the Quest Chambers. Each boss has its own special AI routine. ShadowSea is a tabletop wargame using the "Song of Blades" game mechanics (of Ganesha Games) set in an alternate 17th century world, where forces battle in a mysterious underground ocean beneath a frozen southern continent. Each force competes across ancient ruins, fungal forests and the shores of the Shadow Sea to claim powerful artifacts and golden treasures. Players command warbands in battles that can span long campaigns, developing their warriors as they gain experience though combat, exploration and recovery of treasure. The game is played on the tabletop in an area of a meter square of less. The game is typically played with small warbands of 3-6 models in matches that last around an hour, though longer games with more models can be played as well. Some examples of gameplay are shown in the video below from Crankyoldgamer.net. In addition tho the Stygian Depths, we are collaborating with P.L. McCall to bring his character, Grace Flynn, into our game world. This supplement to ShadowSea comes with rules, map layouts and markers so players can help Grace and her crew survive an intense, thematic campaign. The game is meant for solo and co-op play and includes AI rules for enemies and campaign progression for characters and their warband after each scenario. The supplement will include printed and PDF versions as well as optional printed version of the scenario maps. Miniatures are being produced for Grace's warband, including Grace Flynn, Nereus Neptune, Seaton the Mariner and Bloody Brona, all shown below. Grace Flynn's miniature has already been produced but the others still need to be sculpted. Example sceanrio with a boss battle with an Ancient Storm Dragon, showing the boss AI rules. - Two wild creature miniatures, animals that hunt both forces. DeepWars gets two Gray Pointer Sharks and ShadowSea gets two Ripperclaw Lizards. For DeepWars, we have "Battle for Diablo Reef" a skirmish between the Fortune Hunters and Dark Mariners spanning multiple scenarios amid a shallow reef and through shipwrecks. For ShadowSea, we have "Battle of Deadwood Forest" pitting the Axibalan Empire against the Draconid Legion through multiple scenarios within ruins and forest with giant mushrooms. Backers get their choice of items depending on their pledge level. Some pledges come with miniature "points" that can be used to choose anything from the initial goals or unlocked by stretch goals. The point-based method allows trading these miniatures for other items. 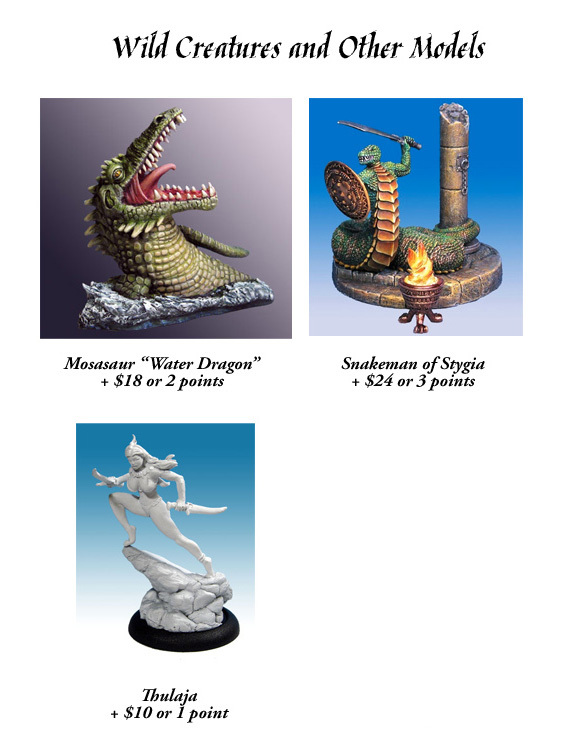 Each miniature on a 30 mm base is worth 1 point, but larger miniatures on 40 mm or 50 mm bases can be 2 or more points.The rewards shown below have a point value so backers can pick and choose how to spend their miniature points. Those that backed any one of our previous projects at $100 or higher and back this one at $100 level or higher get one bonus miniature point added to their rewards. Those that backed a previous project at $200 or higher get 2 bonus points if they back at $215 or more for this one (not including extra international shipping). These bonuses are not cumulative. Items in the reward levels may be swapped for points to use on other items. Two-player Starter Sets, for example, can be swapped for 10 points, Warband Starter sets can be swapped for 4 points each, Softcover DeepWars rulebooks can be swapped for 3 points, hardcover rulebooks for 7 points. PDF books cannot be swapped for points. Most of our 28-32mm tall miniatures are cast in white metal, giving them high detail level and a nice solid heft. Larger miniatures like the Obliterator Biomech and Iron Predator Mech and some personality models are cast in rigid, high-detail resin, preserving the maximum level of detail while reducing weight. 4 metal miniatures with 30mm plastic base and metal base insert, game cards for each miniature, printed quickstart rules folded sheet, a sheet of game counters, measurement sticks and a Warband Record Sheet. One can add any unlocked models, books, terrain and starter sets to the pledge by either adding a monetary amount shown for the item or by spending the extra points that come at different pledge levels. Some of the the new items that can be added as rewards are shown below. We are introducing a new polyurethane cast game board section(18" x 18") for DeepWars as a reward below and a full 36"x36" set of four boards, with a painted pre-painted option. For some higher resolution photos of the board, check here. Backers may add rewards from the existing library of DeepWars and ShadowSea items. Click on the links below to see additional reward options. Note: All DeepWars miniatures that can be used in ShadowSea and the Stygian Depths with no modifications to the model have a gold coin next to them on the list of "unlocked" reward items that can be chosen by backers. Other models can be used with modification to equipment (for example, addition of a dive suit) or with modifiers to weapon effects (underwater weapons get -1 to combat rolls). These modifiers and how to account for edits to models, such as adding equipment, are fully described in the rulebooks. What it means is that most models can be used for both land and sea games. If a backer would like to get new game cards for models already on hand, each card can be added for $0.50. This can be directly added to the pledge. There is pledge level with fully painted miniatures, the Painted Battle Set, which inclused a fully painted two-player set for DeepWars or ShadowSea. The painting will be done by lonebrushman-studio. Click the link to visit the website and view the samples there for the "Tournament Level". An example of the quality is below. We are going to be calculating the shipping costs through the USPS at the time of shipment and allow them to be paid through Paypal. This allows us to determine the cost for shipping in bulk to our UK distribution center for fulfillment to the EU and UK. We will be using GamesQuest once again to handle fulfillment to the EU and UK so that VAT and other fees are included in the pledge (EU Friendly). Gamesquest only handles the shipments, so all payments, refunds, and replacements are handled through AntiMatter Games. For US shipments, AntiMatter Games handles everything like before. For most rewards of a few miniatures, we ship using a padded envelope to save on shipping costs. For anything heavier, we used boxes. These values are estimations for the standard rewards and are high due to the number of printed books included. Any additional items added to the rewards will affect the weight and the final shipping costs. Certain items add more weight than others. Vinyl game mats and printed books add around 1-2 lbs to the weight and require larger boxes, so they add between $10-$20 to shipping, depending on the country. Backers with newly produced rewards that want to receive their existing items early can pay for the extra cost of two shipments, based on weight of items. This is handled after the kickstarter ends. Note: Backers can choose to get their rewards from this Kickstarter shipped within 4 weeks of the ending if the items are currently produced and in stock. We cannot guarantee that all items will be in stock immediately after the project ends but we will ship as soon as they are cast or printed and are available. All newly produced items and stretch items are targeted for the project ship date. If the project is funded, we will continue to add additional stretch goals to achieve so that we can create more products. Stretch items are intended to be produced at the same time as the core project items, although some may take longer. Any additional time to complete any stretch items will be estimated and noted for that item. We also have bonus points that are added to pledges as we hit certain milestones. These points are used for items from above or stretch items as they are unlocked. The first goal is to get 95 backers. The first stretch goal is to unlock the Ancient Storm Dragon, a massive boss from the Grace Flynn adventure. It will be a large dragon, about 150 mm in length and cast in resin. The next goal is The Mistress of Pleasure, a servant of the Nereid Witch in the Garden of Pleasure Quest Chamber. She will be a resin miniature, about 32mm tall, on a 30mm round base. The next goal is to unlock the Corrupted Nereid Witch, a boss from the Stygian Depths. She will be usable in DeepWars and ShadowSea as she is Amphibious and can be used in a Nereid warband, though she is not very sociable. She will be a resin miniature, about 80mm long (head to end of tail), on a 40mm round base. This next stretch goal is for two models, the snakeman warrior and archer. These are dangerous enemies found in the Stygian Depths. These models will be cast in resin, around 60-80mm long, and will be set on 40mm bases. The next goal is for a massive Elder Sea Dragon, an amphibious monstrosity that acts as a "submersible" for the Scaly Horde, towing smaller models around. This model will be cast in resin and will be around 200mm long, similar in size to the DeepWars submarine models. It will also have a special Quest Chamber designed for it to be a mega-boss in the Stygian Depths. Next up is a Boss monster in the Stygian Depths, the Giant Eurypterid. It is a super-sized and hungrier version of the ones that prowl the shallow shelf in DeepWars and will be a resin miniature, about 100mm long (head to end of tail), on a 50mm round base. Next up is a boss from the Stygian Depths, the Snakeman Demonologist. This evil creature is Amphibious and a master of arcane magic. It will be a resin miniature, about 80mm long (head to end of tail), on a 40mm round base. Next up we have some wandering fungal zombies from the Stygian Depths. These hapless adventurers have been infested by fungal spores and now hunger for brains. This stretch goal is for the largest of the demons that guard the Stygian Depths, the mighty Onigor. These huge demons command the other minions and relish taking trophies from the bodies of the temple invaders. This model will be cast in resin, around 50mm tall, on a 40mm base. Up next is the Bakemon Demon, a cruel minion of the Stygian Depths. This model will be cast in resin, around 32mm tall, on a 30mm base. The next stretch goal is a miniature for Deepwars, Grace Flynn in a dive suit. She will be a resin miniature, around 32mm tall, on a 30 mm base. The next stretch goal is for the boss for the Temple of Blood Quest chamber, the Elder Ethereal Gothagga. These entities move through different dimensions and are summoned by ethermancers. This model will be cast in resin, around 100mm tall. The next stretch goal is for Xathal, the boss for the Quest Chamber, A Bridge Too Far. This ethereal monstrosity can be summoned by ethermancers in DeepWars or ShadowSea. This model will be cast in resin and will be around 50mm wide. The Next goal is to unlock the Abyssal Ice Spider. These demonic spiders live in a dimension of ice and crystal but may appear in areas where dimensional rifts have opened up a gateway for them to make their lairs in the Stygian Depths. Up next is a Cyclops from the Grace Flynn adventure. This is a wild creature of the Skeleton Coast of the Shadow Sea and can sometimes be found in the Stygian Depths. This model will be cast in resin and will be around 90mm tall. There are many steps to completing this project but we feel that we can manage it well as this will be our eighth Kickstarter project. The others produced rewards that shipped in a timely manner, with few delays to the core funded products. We now have extensive experience in printing 3D models and hand-sculpting other and casting them, so we expect the production of the submarine and other miniatures to go smoothly. The biggest challenge we expect will be in timing all of the different aspects of design so that they reach completion at expected deadlines. We have learned though our our previous projects that issues do occur during production and to leave sufficient time and funds to mitigate the issues. Basic - Get PDF copies of the Stygian Depths and Grace Flynn - Tides of Forever and 1 point for a miniature or item of your choice. Captain - You get a Warband Starter Set (4 models) of your choice. It also comes with the PDF files for the Stygian Depths rulebook, floor tiles and cards, the Grace Flynn book and the Painting Scaly Beasts painting guide. Dungeon Master - You get all of the Stygian Depths floor tiles and game cards. It also comes with the PDF files for the Stygian Depths rulebook, floor tiles and cards, the Grace Flynn book and the Painting Scaly Beasts painting guide. Battle Set - You get a Two-Player Starter set of your choice (ShadowSea or DeepWars). It also comes with the PDF files for the Stygian Depths rulebook, floor tiles and cards, the Grace Flynn book and the Painting Scaly Beasts painting guide. Adventurer - You get The softcover Stygian Depths book, floor tiles and cards, one Warband Starter Set (4 models) of your choice and the softcover Grace Flynn book. 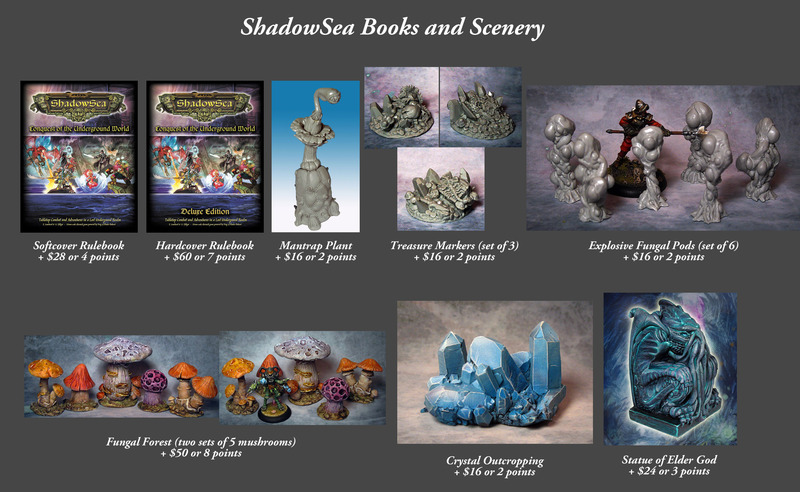 It also comes with the PDF files for the all of the books above as well as the full ShadowSea rulebook and the Painting Scaly Beasts painting guide. Gamemaster - You get The softcover Stygian Depths book, floor tiles and cards, the softcover Grace Flynn book and the softcover ShadowSea rulebook. It also comes with the PDF files for the all of the books above and the Painting Scaly Beasts painting guide. In addition, it comes with the a two-player starter set, two Warband Starter Sets and 5 points of miniatures or items of your choice (see Reward Choices section for instructions on using points to choose rewards). Painted Battle Set - You get a Two-Player Starter set of your choice (ShadowSea or DeepWars), painted at Tournament level by lonebrushman-studio.com, and a softcover rulebook. It also comes with the PDF files for the Stygian Depths rulebook, floor tiles and cards, the Grace Flynn book and the Painting Scaly Beasts painting guide. Gamemaster Pro - You get the softcover Stygian Depths book, floor tiles and cards, the softcover Grace Flynn book and the hardcover ShadowSea rulebook. It also comes with the PDF files for the all of the books above and the Painting Scaly Beasts painting guide. In addition, it comes with both two-player starter set, three Warband Starter Sets and 15 points of miniatures or items of your choice (see Reward Choices section for instructions on using points to choose rewards). Gamemaster Ultra - You get the softcover Stygian Depths book, floor tiles and cards, the softcover Grace Flynn book and the hardcover ShadowSea rulebook. 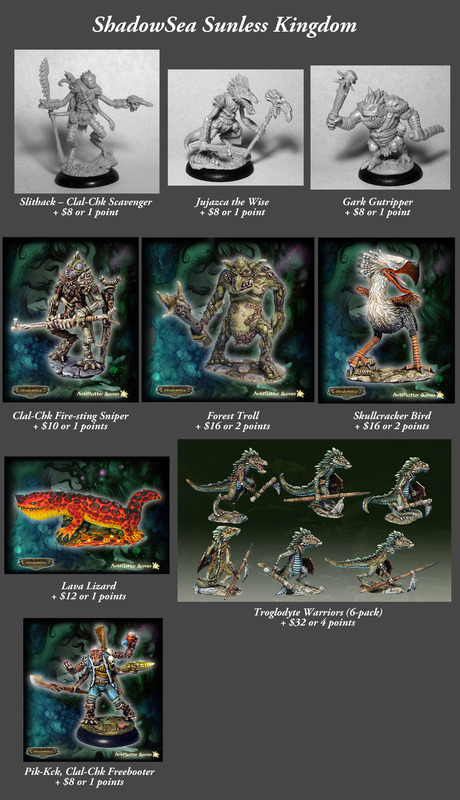 It also comes with the PDF files for the all of the books above and the Painting Scaly Beasts painting guide. In addition, it comes with both two-player starter set, four Warband Starter Sets and 30 points of miniatures or items of your choice (see Reward Choices section for instructions on using points to choose rewards). All printed books come signed by the author.